It’s a pretty daunting thought when you find out that you’re pregnant that there will soon be a day where 80% of your wardrobe just will not fit. Fortunately, I got to 23 weeks wearing everything and anything I did before. 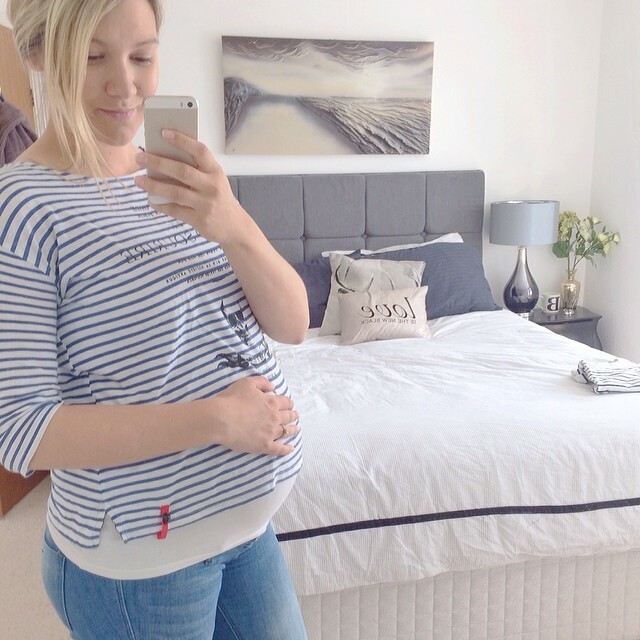 At 23 weeks, I bought my first pair of maternity jeans and at 32 weeks, I am finding it harder and harder by the day to stretch tops over my ever growing bump. I haven’t invested too much in Maternity clothes (mainly because they’re boring and huge) but I have invested in one pair of lightly coloured maternity jeans, one pair of black maternity jeans (smart enough that I can wear for work), one pair of maternity leggings and one maternity blouse. 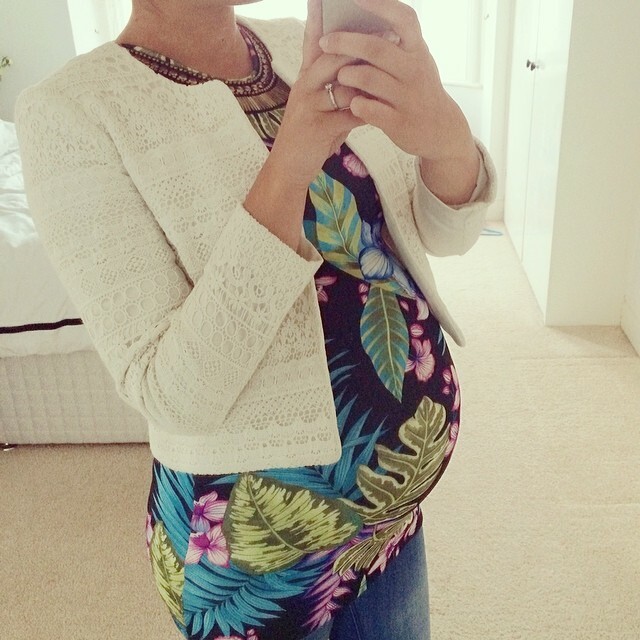 Thankfully, I have a few tops and dresses which I am still squeezing in to, so I thought I’d share a few outfits from my very colourful 30 week pregnancy wardrobe so far! This little cream lace jacket from H&M is the most versitile jacket I have ever bought. Dress up or dress down, it fits perfectly with my changing shape, is the perfect length to show a bit of bump and goes with pretty much anything. I’m so obsessed with stripes and although this top is now much too short to wear on its own, it doesn’t look as odd as you’d imagine (or at least I hope), with a vest underneath. On Tuesday, we went for a date night meal at Tiien. The sun was shining and I wanted to get a little more dressed up than my usual jeans and t-shirt attire. Thankfully I found this stretchy Primark dress in my wardrobe which fits perfectly now as a top! 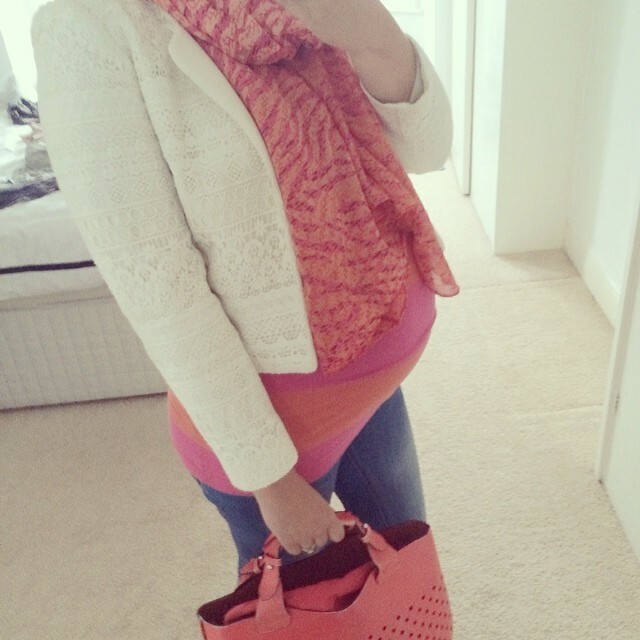 My favourite colour combo, orange and pink, for a dinner date with the girls. 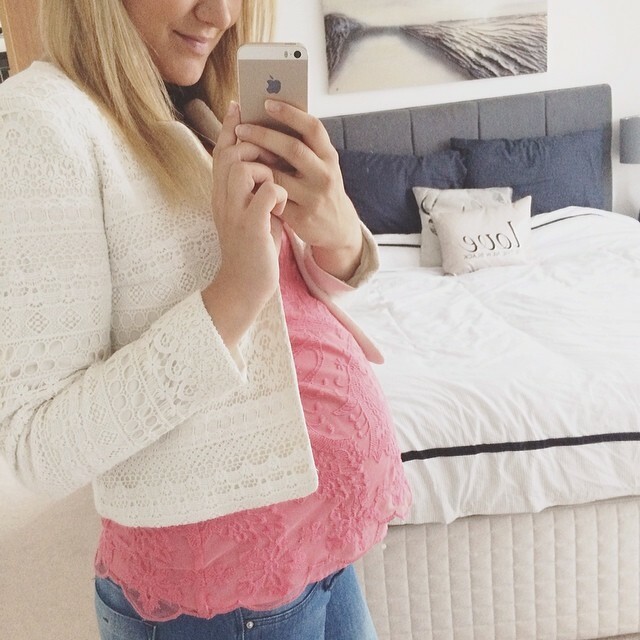 I don’t think being pregnant should take away from your everyday style. Of course, you can’t rock a pair of mini shorts like you could before, and staggering around the office in heels is definitely not something I could conquer, but I’ve still tried to keep true to my usual style and so far, I think I’m just about doing it!